Starting point guard D'Angelo Russell sat the final 16 minutes while Spencer Dinwiddie and Caris LeVert took charge. For those who wondered why the Nets traded Jeremy Lin last summer, the crowd in the Nets’ backcourt is real. 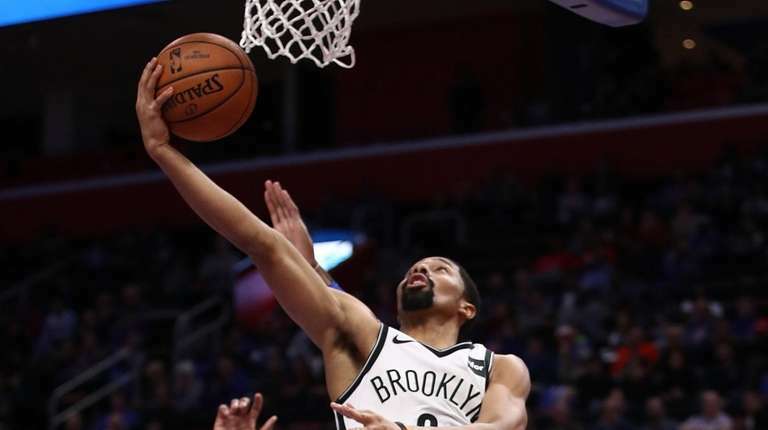 Starting point guard D’Angelo Russell learned as much when he sat out the final 16 minutes of the Nets’ season-opening 103-100 loss Wednesday night in Detroit while backup point guard Spencer Dinwiddie and Caris LeVert, who is like a point forward, ran the show. LeVert and Dinwiddie totaled 50 points, and the Nets had more drives to the rim than any other NBA team that night. As coach Kenny Atkinson explained after Thursday’s practice, it was a case of going with the hot hands. In the final 10 seconds, LeVert, who led all scorers with 27 points, committed a turnover on a drive and two-guard Joe Harris missed a potential tying three-pointer at the buzzer. Russell hit a few game-winners last season, but it would have been tough for him to come in cold at the end. The Nets’ backcourt will be even more crowded against the Knicks. Allen Crabbe was listed as probable after practicing and scrimmaging for the first time since injuring an ankle in the second preseason game. He probably will come off the bench rather than step into his starting two-guard role, but the Nets can use Crabbe’s three-point marksmanship. Notes & quotes: Rondae Hollis-Jefferson (strained adductor), who was held out in Detroit, is cleared to play the Knicks. But after Hollis-Jefferson enjoyed the birth of his first son on Thursday, Atkinson said his playing status will take a backseat to any family issues.